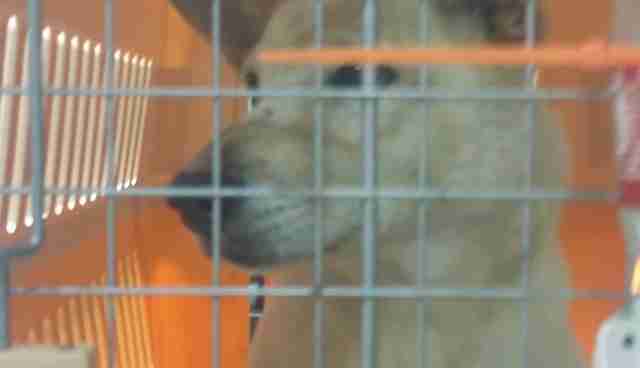 Some animals experience such horrors, it's nothing short of a miracle when they survive. 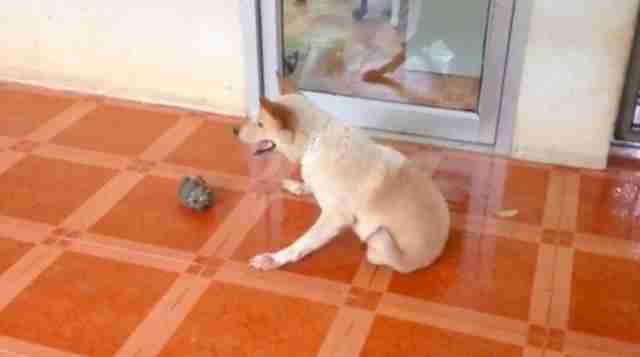 When Scooter was found in Thailand in March, her legs had been removed and her spine was broken. 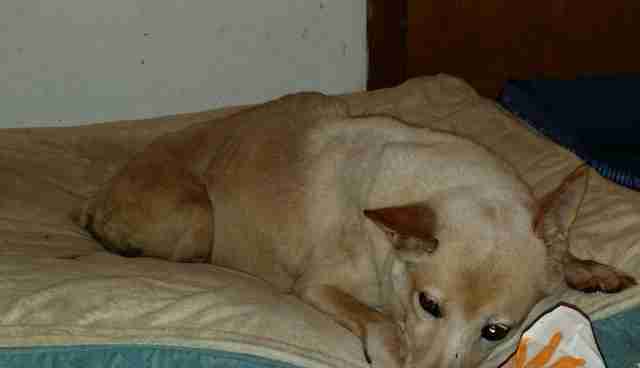 There's no way to know why this was done to Scooter, but she had been dragging her broken body around for at least 3 months before she was rescued, causing terrible infections along the underside of her body. 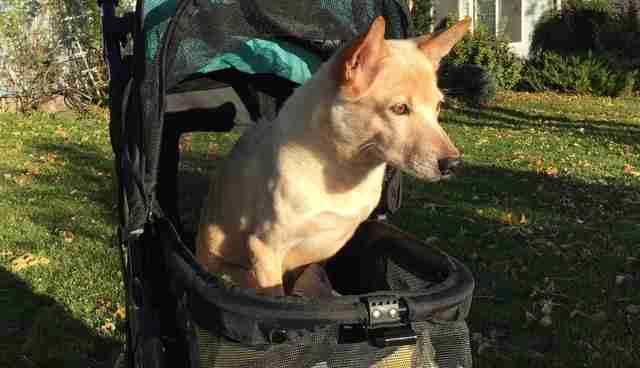 When she was finally brought to safety, it was clear only a miracle dog could have survived what Scooter went through. Scooter was rescued by the Soi Dog Foundation, where Willow Sullivan found her. Sullivan runs an animal sanctuary and rescue called Willow's Wings in New York, and had adopted from Soi Dog Foundation before. "One night I was looking on the Soi Dog Facebook page and I came across the post on Scooter. I barely finished reading and immediately sent an email," Sullivan told The Dodo. Sullivan first started Scooter's adoption process in August, and on September 29 she finally arrived in the U.S. Even though she was saved from unspeakable horrors, Scooter's journey to health and happiness was far from over. When Scooter first arrived into Sullivan's care, she was absolutely terrified of people. Whatever had happened to her in the past had made her extremely distrusting and when Sullivan approached her for the first time, Scooter snapped and growled at her. "I stepped back, giving her some space, took a deep breath and wondered, 'Oh my, what have I gotten myself into now?" Sullivan said. 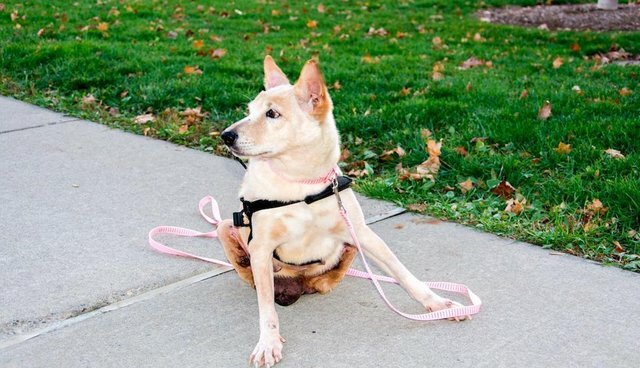 Despite Scooter's emotional issues, one of the main priorities was figuring out if she could receive a wheelchair so she would no longer have to painfully drag herself around. Scooter was taken to the Cornell University College of Veterinary Medicine, where she met veterinarian Chris Frye. 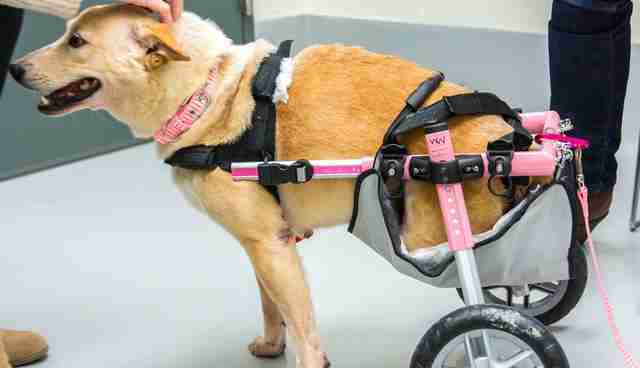 "When Scooter came in for a potential cart-fitting, I walked in and saw this dog with no back legs who had definitely fractured her spine - right away I knew she was a patient with major problems," Frye told The Dodo. Before Scooter could be fitted for a cart, Frye needed to determine if she was a good candidate for one. "The concern was that if the bones hadn't healed together and formed some type of union she'd be putting pressure on her spine, so we did a scan to make sure," said Frye. 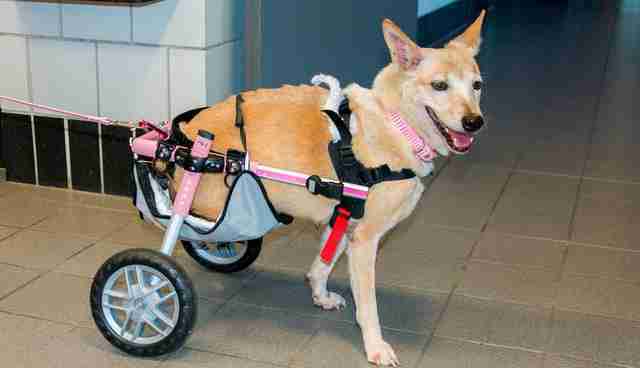 In the end, Frye determined a wheelchair would be beneficial for Scooter, and began the process of getting her one. Everyone Scooter met at Cornell was absolutely in awe of her and all she had survived. "When I picked her back up that evening, the words, 'It is truly amazing this dog is alive,' were stated many times," Sullivan said. 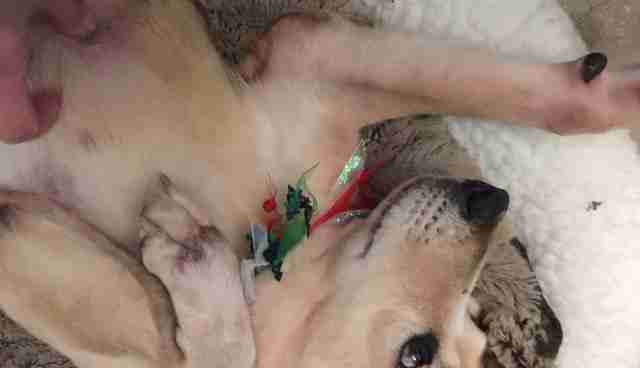 "The extent of the broken bones, the way her spine was able to heal ... she was a miracle dog." Over the next few weeks, Scooter's personality began to change drastically. She no longer tried to bite people, and began to love and trust Sullivan more than she ever thought was possible. Finally, the day came that they had all been waiting for - Scooter's cart was finally ready. "When we first got it on her, she started walking backwards. Once we got her outside, she realized what was going on and just took off running," Frye said. "Her excitement at being able to move again for the first time in who knows how long is one of the greatest parts of my job." Today, Scooter is unstoppable. Sometimes when she's without her cart she is still a little apprehensive, likely remembering the immense pain she went through. When she's in her cart, her confidence is palpable. "Scooter loves the barn animals, so everyday I hook her up to the cart and head for the barn. She knows the way herself now," Sullivan said. "She lights up and become so vibrant when she is on an adventure. It makes me cry and smile at the same time." When Scooter was found she was injured, aggressive and in more pain than anyone could imagine. Now, thanks to everyone who helped her, Scooter is walking again, loving again and living a life no one ever thought she could have with Sullivan at Willow's Wings. 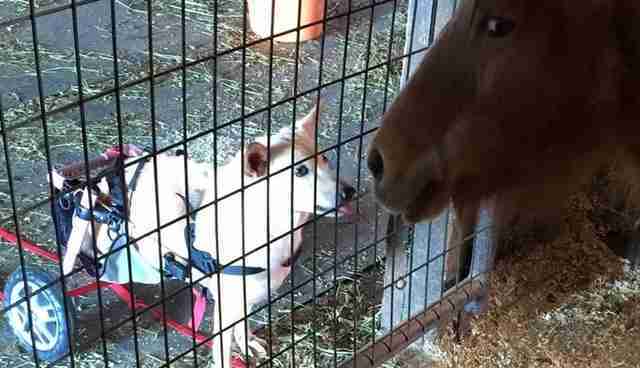 "She is one of our many special needs animals here, a very special girl that found me from halfway across the world ... and I couldn't imagine my life without her," Sullivan said.